Android Oreo-based MIUI 10 brings performance improvement, increase battery life, India region-specific custom features to the Xiaomi Redmi 6 Pro and Redmi 5 in India. After the releasing the MIUI 10 to the Redmi 6 and the 6A series, Xiaomi has expanded the availability of the new software to two more devices at least in India. 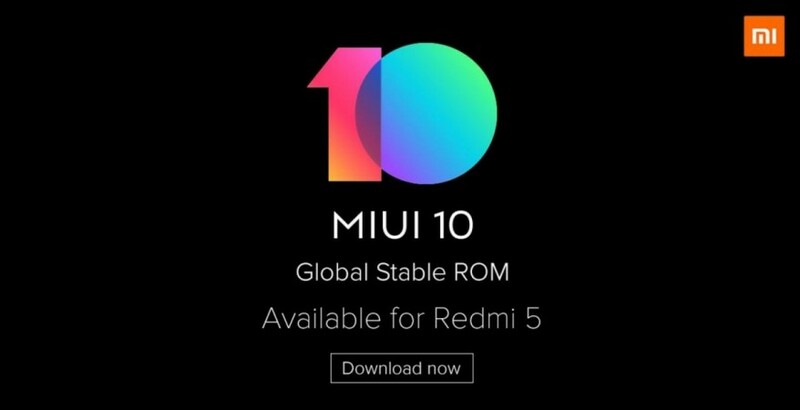 The official Xiaomi MIUI India Twitter handle confirmed the news that the stable version of the MIUI 10 Global ROM is being rolled out to the Redmi 6 Pro and the Redmi 5 via OTA (Over-The-Air). So far, Xiaomi has released Android Oreo-based MIUI 10 to the Redmi Y2, Redmi Note 5, Note 5 Pro, Redmi 6 and Redmi 6A, Redmi Note 4 (with Qualcomm chipset) and now to the Redmi 6 Pro and the Redmi 5. The company has plans to deploy MIUI 10 ROM to more devices including Mi 8, Mi MIX 2S, Mi MIX 2, Mi MIX, Mi 6X, Mi 6, Mi 5, Mi Note 2, Mi Note 3, Mi 5X, Mi 5c, Mi 5s, Mi 5s Plus, Mi 4, Mi 4c, Mi 4S, Mi Max 2, Mi Max, Redmi Y1, , Redmi 4, Redmi 4A, Redmi 4X, Redmi 3S/Redmi 3X, Redmi Pro, Redmi Note 5A, Redmi Note 4 (MTK) and the Redmi Note 3 (Qualcomm). Step 1: Once you get new software notification, select "Yes, I'm in"
Step 2: After the software is downloaded, select "Install now"
If you haven't received any update notifications, check it manually by going to Settings >> phone >> check system update. If it says there is an update available, follow the procedure as mentioned above. In 2018, phones even from Xiaomi come with widescreen having 18:9 aspect ratio. To make full use of the new FullView display, MIUI 10 has been designed to enhance the user experience with its upgrades in design, speed, AI and sound. It will come with several simple full-screen hand gestures along with new features such as more content in the tiled taskbar and improved swiping gestures (up and down for switching tasks, sideways to end current task), users will be delighted with the increase in their multitasking efficiency. The company promises that users will be able to seamlessly switch to full-screen gestures. Also, MIUI 10 will provide a much more productive experience with a completely redesigned recent apps menu showing up to 5 apps in one screen. The highlight of the 2107-based MIUI 9 was 'Lighting Fast', this time too, Xiaomi is promising MIUI 10 will make the devices more responsive in terms of app loading and more. It also comes with two critical system optimisations—Lock-free critical path and Codependent prioritizing, which improves the overall responsiveness of MIUI 10 by 10%. The new MIUI 10 brings a completely new system of sounds. From notifications to audio feedback and ambient sounds from an app like the timer with nature-related water droplets, rain, sand dunes in the wind on a desert, forest sound with waterfall effect, ocean wave sound and more, which soothes the users' mood rather than annoyed by notifications and calls. MIUI 10 is also designed in a way that will reduce the aural clutter. Most of the Xiaomi device owners are already familiar with a personalized theme for India including the pachanga calendar, festival related wallpapers and more in MIUI 9. Now, the new MIUI 10 follows up the region-specific feature such as the camera app doubling up as a Paytm QR code scanner, a local service page in the in-built browser with full support for PWA (progressive web apps), and the content-rich libraries of Mi Music and Mi Video ensure a great, entertaining and an ergonomic experience. It also adds a quick menu tab to all business messages, which allows users to explore more about the service with one tap. Stay tuned. Follow us @IBTimesIN_Tech on Twitter and on Google News for the latest updates on Xiaomi.